Campaign fliers sent out by Senator Robert Meza, who is running against Raquel Teran for a seat in Legislative District 30, are causing yet another stir in an already heated race. 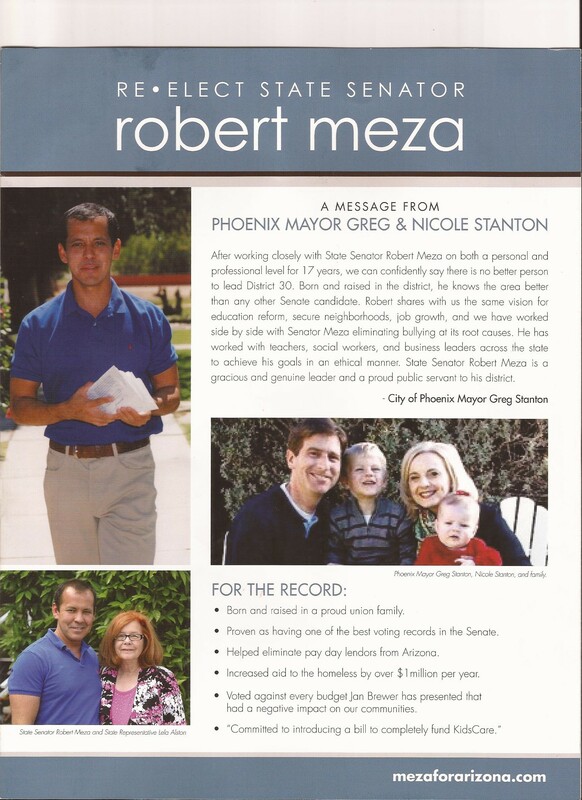 Meza apparently snagged an old campaign photo of Mayor Greg Stanton sitting with wife, Nicole, and their two children, and used it in a hit piece against Teran -- without Stanton's permission. He also used the photo in another piece of campaign literature touting "a message from Phoenix Mayor Greg and Nicole Stanton." Meza blames the whole thing on a "miscommunication" between him and the graphic designer in Texas who created the fliers. In the hit piece, Stanton is purported to say: "Stop the dirty campaigning against fellow Democrats" and "Let's have an honest campaign based on facts and experience." Political insiders say that Stanton -- and his wife -- were fuming about the unauthorized use of the photos and quotes. Stanton confirms to New Times that "neither Nicole nor I authorized the use of our photos in a negative campaign piece -- for any of the candidates I've endorsed this cycle." Meza tells New Times that the graphic designer in Texas created the campaign flier and mailed it out without first allowing Meza to review and approve it. The campaign fliers, sent to residents in the west Phoenix legislative district, were spotted by supporters of Stanton's mayoral campaign, including members of labor unions. They were reportedly irked because they hit the streets hard for Stanton when he was running for mayor, and now he's endorsing someone who they say has cast anti-union votes during his time at the state legislature. "Robert Meza asked for my endorsement in late 2011. Robert and I have been personal friends and professional colleagues for many years. I do support his candidacy for re-election to the legislature," he says. "Subsequent to giving him my endorsement, I learned that Raquel Teran was going to be running for that state senate seat. I know her and respect her and admire her." Bob Grossfeld, a spokesman for the UFCW, didn't say they were upset with Stanton, but says they are upset with "how [Meza] has conducted himself during this election." Perhaps it's just a coincidence (or our cynicism), but Stanton met with student volunteers on Monday night at UFCW offices and hit the streets with them (not in LD30) to register new voters. Those volunteer teams are part of The Campaign For Arizona's Future, a drive to register at least 40,000 new Latino voters for the 2012 election. Is Stanton extending an olive branch of sorts? This is the latest dust-up in Democrat on Democrat race. During this campaign, Meza allegedly threatened to sue a young volunteer working for his opponent's campaign, and he's also filed several election-related complaints against his opponent. One has been filed against him over alleged campaign-finance improprieties. State election officials are investigating all complaints. 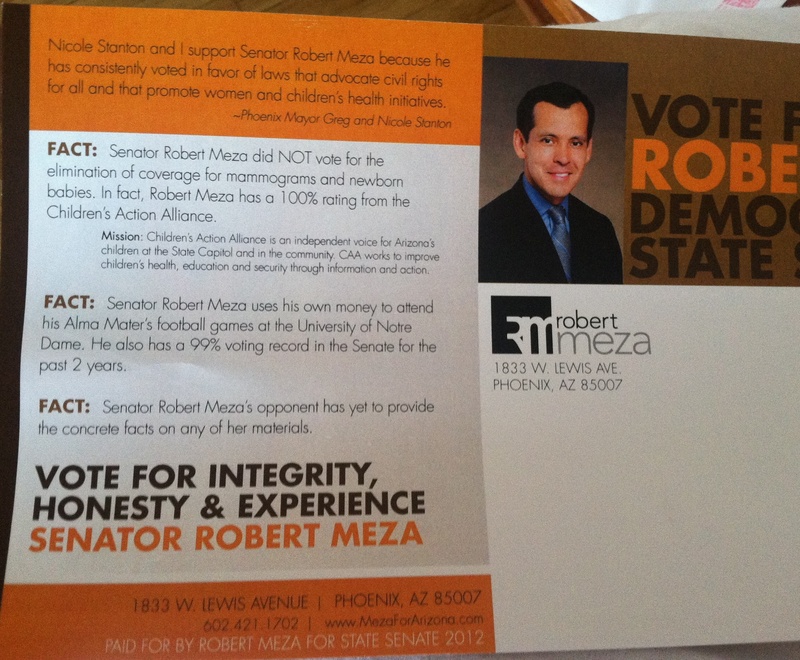 View Meza's other campaign fliers with unauthorized use of the Stanton family name and likeness: Vote for Integrity and A Message from Phoenix Mayor.